This person's surname is Shinawatra. Yingluck Shinawatra (Thai: ยิ่งลักษณ์ ชินวัตร, RTGS: Yinglak Chinnawat, pronounced [jîŋ.lák t͡ɕʰīn.nā.wát]; born 21 June 1967), nicknamed Pou (Thai: ปู, RTGS: Pu, pronounced [pūː], meaning "crab"), is a Thai businesswoman, politician and a member of the Pheu Thai Party who became the 28th Prime Minister of Thailand following the 2011 election. Yingluck was Thailand's first female Prime Minister and its youngest in over 60 years. She was removed from office on 7 May 2014 by a Constitutional Court decision. Born in Chiang Mai Province into a wealthy family of Hakka Chinese descent, Yingluck Shinawatra earned a bachelor's degree from Chiang Mai University and a master's degree from Kentucky State University, both in public administration. She then became an executive in the businesses founded by her elder brother, Thaksin Shinawatra and later became the president of property developer SC Asset and managing director of Advanced Info Service. Thaksin served as Prime Minister from 2001 until 2006 when he was overthrown by a military coup. He fled abroad shortly before he was convicted in absentia of using his position to increase his own wealth. He has since lived in self-imposed exile to avoid his sentence in prison. In May 2011, the Pheu Thai Party, which maintains close ties to Thaksin, nominated Yingluck as their candidate for Prime Minister in the 2011 election. She campaigned on a platform of national reconciliation, poverty eradication, and corporate income tax reduction and won a landslide victory. After mass protests against her government in late 2013, she asked for a dissolution of parliament on 9 December 2013, triggering a snap election, but continued to act as caretaker prime minister. On 7 May 2014, the Constitutional Court of Thailand removed Yingluck Shinawatra from the office of caretaker prime minister and defence minister following months of political crisis. The court found her guilty of charges of abuse of power over the removal of national security chief Thawil Pliensri in 2011. In the wake of the May 2014 military coup, Yingluck was arrested along with former cabinet ministers and political leaders of all parties and held at an army camp for a few days while the coup was consolidated. She was tried in 2016 but did not appear in court in August 2017 for the verdict. An arrest warrant was issued. She reportedly fled the country. In September 2017, she was found guilty in absentia and sentenced to five years in prison. She is rumoured to now be in London, England. Yingluck has become the chairwoman and legal representative of Shantou International Container Terminals Ltd since 12 December 2018, a Chinese port operator, operating in the Shantou Port area in eastern Guangdong. Yingluck Shinawatra is the youngest of nine children of Loet Shinawatra and Yindi Ramingwong. Her father was a businessman and member of parliament for Chiang Mai. She is a descendant of a former monarch of Chiang Mai through her maternal grandmother, Princess Chanthip na Chiangmai (Great-great-granddaughter of King Thammalangka of Chiang Mai). Yingluck grew up in Chiang Mai and attended Regina Coeli College, a private girls' school, for the lower secondary level, followed by Yupparaj College, a co-educational school, at the upper secondary level. She graduated with a BA degree from the Faculty of Political Science and Public Administration, at Chiang Mai University in 1988 and received a MPA degree (specialisation in Management Information Systems) from Kentucky State University in 1991. Yingluck began her career as a sales and marketing intern in 1993 at Shinawatra Directories Co., Ltd., a telephone directory business founded by AT&T International. She later became the director of procurement and the director of operations. In 1994, she became the general manager of Rainbow Media, a subsidiary of International Broadcasting Corporation (which later became TrueVisions). She left as Deputy CEO of IBC in 2002, and became the CEO of Advanced Info Service (AIS), Thailand's largest mobile phone operator. After the sale of Shin Corporation (the parent company of AIS) to Temasek Holdings, Yingluck resigned from AIS, but remained Managing Director of SC Asset Co Ltd, the Shinawatra family property development company. She was investigated by Thailand's Securities and Exchange Commission regarding possible insider trading after she sold shares of her AIS stock for a profit prior to the sale of the Shin Corporation to Temasek Holdings. However, no charges were filed. Yingluck Shinawatra is also a committee member and secretary of the Thaicom Foundation. Yingluck received 0.68 percent of Shin Corp shares out of the 46.87 percent that Thaksin Shinawatra and his then-wife held in 1999. The military junta-appointed Assets Examination Committee charged that Yingluck made up false transactions and that "there were no real payments for each Ample Rich Co., Ltd shares sold" and "the transactions were made at a cost basis of par value in order to avoid income taxes, and all the dividends paid out by Shin to those people were transferred to [her sister-in-law] Potjaman's bank accounts". However, the AEC did not pursue a case against her. Yingluck, in response, claimed that "her family has been a victim of political persecution". She has one son, Supasek, with her common law husband, Anusorn Amornchat. Anusorn was an executive of the Charoen Pokphand Group and managing director of M Link Asia Corporation PCL. Her sister, Yaowapa Wongsawat, is the wife of former prime minister, Somchai Wongsawat. After the governing People's Power party was dissolved and its executive board was banned from political activity for five years by the Constitutional Court on 2 December 2008, the former People's Power Party MPs formed the Pheu Thai Party. Yingluck was asked to become the party's leader, but she declined, saying that she had no desire to be prime minister and wanted to concentrate on business. Yongyuth Wichaidit became the leader of the party. US diplomatic cables leaked in 2011 revealed that during a 9 September 2009 meeting, former Deputy Prime Minister and "close Thaksin ally" Sompong Amornvivat told Ambassador to Thailand Eric John that he did not envision a big role for Yingluck in the Pheu Thai Party, and that "Thaksin himself was not eager to raise her profile within the party, and was more focused on finding ways to keep his own hand active in politics." However, in a subsequent cable dated 25 November 2009, the ambassador noted that in a meeting with Yingluck, she spoke with confidence about the "operations, strategy and goals" of the Pheu Thai party and seemed "far more poised" than in previous meetings. The cable cited Yingluck saying that, "Someone could easily emerge relatively late in the game to take the reins of the party and serve as the next Prime Minister." Yingluck's bank account was among 86 accounts that the Abhisit government accused of being used to finance the Red Shirt protesters during their demonstrations in 2010. Abhisit accused the Red Shirts of trying to overthrow the monarchy, something they denied. However, the government did not pursue any legal action against her. The Department for Special Investigation found that from 28 April 2009 to May 2010, 150 million baht was deposited into one of her accounts while 166 million baht was withdrawn. On 28 April 2010 alone, 144 million baht was withdrawn. Yongyuth had stated his intention of resigning as party leader in late 2010. Speculation about a snap election in early 2011 heightened internal debate over the party leadership. The front runners were Yingluck and Mingkwan Sangsuwan, who had led the opposition in an unsuccessful motion of no confidence against the Democrat Party-led coalition government. As late as 28 January 2011, Yingluck continued to rule out the party leadership, repeating that she wanted to focus on business. However, she was endorsed by veteran politician Chalerm Yubamrung. On 16 May 2011, the Pheu Thai party voted to name Yingluck as their top candidate under the party-list system (and presumably be the party's nominee for Prime Minister) for parliamentary election scheduled for 3 July. However, she was not made party leader and did not join the party's executive board. The ultimate decision was made by Thaksin himself. "Some said she is my nominee. That's not true. But it can be said that Yingluck is my clone... Another important thing is that Ms Yingluck is my sister and she can make decisions for me. She can say 'yes' or 'no' on my behalf," noted Thaksin in an interview. Pheu Thai campaigned with a slogan of "Thaksin thinks, Pheu Thai acts". Yingluck's main campaign theme was reconciliation following the extended political crisis from 2008 to 2010, culminating in the military crackdown on protesters which left nearly 100 protesters dead and thousands injured. She promised to empower the Independent Truth and Reconciliation Commission of Thailand (ITRC), the panel that the Democrat-led government had set up to investigate the killings. The ITRC had complained that its work was hampered by the military and the government. Yingluck also proposed a general amnesty for all major politically motivated incidents that had taken place since the 2006 coup, which could include the coup itself, court rulings banning Thai Rak Thai and People's Power Party leaders from seeking office, the People's Alliance for Democracy (PAD) seizures of Government House and Don Muang and Suvarnabhumi Airports, the military crackdowns of 2009 and 2010, and the conviction of Thaksin Shinawatra for abuse of power. The proposal was fiercely attacked by the government, who claimed that it would specifically give amnesty to Thaksin, and also result in the return to him of the 46 billion baht of his wealth that the government had seized as a penalty. However, Yingluck denied that the return of seized assets was a priority for the Pheu Thai party, and repeated that she had no intention of giving amnesty to any one person. Abhisit claimed outright that Yingluck was lying and that amnesty to Thaksin actually was the Pheu Thai party's policy. The government blamed Pheu Thai for the bloodshed during the military crackdown. Yingluck described a 2020 vision for the elimination of poverty. She promised to reduce the corporate income tax from 30 percent to 23 percent and then 20 percent by 2013 and to raise the minimum wage to 300 baht per day and the minimum wage for university graduates to 15,000 baht per month. Her agricultural policies included improving operating cashflow to farmers and providing loans of up to 70 percent of expected income, based on a guaranteed rice price of 15,000 baht per ton. She also planned to provide free public Wi-Fi and a tablet PC to every schoolchild (a Thai Rak Thai Party plan to provide one laptop per child was cancelled after the 2006 military coup). Exit polls indicated a landslide victory, with Pheu Thai projected to win as many as 310 seats in the 500-seat parliament. However, the official result was 265 seats and 47 percent of the vote for Pheu Thai, with a 75.03 percent election turnout rate. There were 3 million invalid ballots; the large number was cited as the cause for the difference between the exit poll results and the official count. It was only the 2nd time in Thai history that a single party won more than half of the seats in parliament; the first time was in 2005 with Thaksin's own Thai Rak Thai Party. United Nations secretary-general Ban Ki-moon welcomed the outcome of the elections and called for all parties to "respect the will of the Thai people as expressed through the democratic process." Aung San Su Kyi congratulated Yingluck, praised the election as "free and fair," and said that she expected "the ties between Myanmar and Thailand to get better." Yingluck quickly formed a coalition with the Chartthaipattana (19 seats), Chart Pattana Puea Pandin (7 seats), and Phalang Chon (7 seats), and Mahachon (1 seat), and New Democracy (1 seat) parties, giving her a total of 300 seats. Outgoing Defense Minister General Prawit Wongsuwan said that he accepted the election results, and after having talked with military leaders, would not intervene. Following the general election, the first separate session of the House of Representatives was held in the morning of 5 August to select a new Prime Minister. 296 of the 500 members of parliament voted to approve the premiership of Yingluck Shinawatra, three disapproved, and 197 abstained. Four Democrat lawmakers were absent. Somsak Kiatsuranont, President of the National Assembly, advised and consented King Bhumibol Adulyadej to appoint Yingluck Prime Minister on 8 August. The Proclamation on her appointment was made retroactive, taking effect from 5 August. Yingluck established her Council of Ministers on 9 August. She and her Ministers were sworn in on 10 August. They were then required to complete addressing their administrative policy to the National Assembly. According to the Constitution, the address had to be made within fifteen days from the effective date of the Proclamation on Yingluck's appointment. Key members of Yingluck's cabinet include former Interior Permanent Secretary Yongyuth Wichaidit as Interior Minister, Securities and Exchange Commission Secretary-General Thirachai Phuvanatnaranubala as Finance Minister, and former Defense Permanent Secretary General Yuthasak Sasiprapa as Defense Minister. Absent from Yingluck's cabinet were Red Shirts who had spearheaded protests against the Democrat-led government. Polls from shortly after her cabinet was announced found that the cabinet rated most highly in terms of economic competency. It also showed that Yingluck was much more popular than her exiled brother Thaksin. The 2011 rainy season saw the highest levels of rainfall in Thailand in the previous 50 years. Flooding started in northern Thailand on 31 July, a week prior to Yingluck's appointment as Prime Minister. Flooding quickly spread from the North to the Central Chao Phraya River Basin, and by the beginning of October, the province of Ayutthaya, north of Bangkok, was almost flooded. The floods were the worst in Thailand in over 50 years. Yingluck established centralised flood monitoring and relief operations in mid-August and made tours of flooded provinces beginning 12 August. Yingluck also pledged to invest in long-term flood prevention projects, including the construction of drainage canals. Flood reduction measures were hampered by disputes between people on the different sides of flood barriers: those on the flooded side in some instances sabotaged the barriers, sometimes resulting in armed confrontation. Opposition leader Abhisit Vejjajiva and military leaders called for Yingluck to declare a state of emergency, claiming that it would give the military greater authority to deal with embankment sabotage. A state of emergency had last been declared in 2010 during the Abhisit-government's crackdown on anti-government protesters. Yingluck refused to declare a state of emergency, saying that it would not improve flood management. Instead, she invoked the 2007 Disaster Prevention and Mitigation Act and issued a disaster warning which gave her government greater authority to manage flood control and drainage. On 18 January 2012, Yingluck reshuffled her cabinet, assigning six cabinet members to new posts, naming ten new ministers and deputies and dismissing nine members of the government. The regrouping was assessed as a step to increase loyalty to the head of government and a reaction to discontent with the government's management of the flood disaster. Especially noted was the choice of Nalinee Taveesin (Minister in the PM's Office), who is on a US blacklist for alleged business links to Zimbabwean President Robert Mugabe, and Nattawut Saikua (Deputy Minister of Agriculture), the first leader of the United Front for Democracy Against Dictatorship (UDD, or "Red Shirts") in the government. Yingluck's first cabinet had not incorporated any "Red Shirts" activists. On 30 June 2013, the fifth reshuffle occurred in the cabinet of Yingluck, leading to changes in 18 cabinet posts. She herself assumed the post of minister of defence in the reshuffle. On 9 December 2013, Yingluck dissolved the country's parliament and called early elections in the face of anti-government protests. On 7 May 2014, the Constitutional Court unanimously dismissed Yingluck from office in consequence of her removing an appointee of an earlier government, Thawil Pliensri, from his post as National Security Council secretary-general in 2011. The court deemed the transfer unconstitutional and therefore, removed Yingluck from office. A few weeks after Yingluck was impeached, the military coup of 2014 occurred. Based on the 2007 Thai constitution, public officials can be charged and imprisoned for abuse of power and negligence, even without proof of corruption. As chairperson of the rice committee, Yingluck was investigated by Thailand's anti-graft agency about her role in the rice pledging scheme. Two of her former ministers were also investigated, and later sentenced for decades in prison. Despite being chairperson of the rice committee, Yingluck admitted in the 2013 censure debate against her government that she had never attended meetings of the National Rice Policy Committee. On 8 May 2014, the National Anti-Corruption Commission (NACC) unanimously agreed to indict Yingluck in the rice-pledging scheme corruption case citing millions of rice farmers who remain unpaid. On 28 November, Thailand's National Legislative Assembly (NLA) denied the addition of 72 pieces of evidence to her rice-pledging case. The first hearing of her impeachment case was also scheduled to be on 9 January 2015. On 15 January 2016, the trial against Yingluck began. On 25 August 2017, the scheduled verdict day, Yingluck did not appear before the court, who then issued an arrest warrant for her and confiscated her ฿30,000,000 bail. 3,000 of her supporters gathered outside the court in Bangkok. Reportedly, Yingluck fled the country ahead of the judgment. Some senior members of her political party said she left Thailand the week before to Dubai. The pronouncement was then rescheduled to 27 September 2017. On 27 September 2017, in her absence, she was found guilty of dereliction of duty over the rice subsidy scheme and was sentenced to five years in prison. Yingluck passports were cancelled by the Junta controlled government, and she is rumored to be in London and to have a UK passport. During Yingluck Shinawatra's tenure as Prime Minister, she travelled to more than 40 countries in an effort to strengthen the relationship between them. Her goals included improvement of trade relations and increased export business investments, and studying water resources management. United States Visited to talk security negotiations with President Barack Obama. India Visited as a guest of the government for the Republic Day celebrations and attended the ASEAN-India Car Rally at Vigyan Bhawan. Cambodia Helped support the Cambodian to buy products of Thailand, and met Hun Sen.
South Korea Swearing in ceremony was attended by the President Park Geun-hye, Republic of Korea. Bangladesh Discuss with the private sector and businessmen. During a dinner party. Organized by the Board of Investment of Thailand (BOI) and the Association of Bangladesh Chambers of Commerce and Industry (FBCCI) at the Radisson Hotel. Hong Kong Signed a Cooperation Arrangement on Strengthening Trade and Economic Relations in Government House. Mongolia Attend the Community of Democracies - CD 7th at Mongolia. Sri Lanka Visit as a guest of the government. and Join the celebration of 260 years of the founding families Siam Nikaya in Sri Lanka. Tajikistan The water management of Tajikistan in co-operation with the United Nations. Pakistan Visit as a guest of the government. and relations with Pakistan in a strong economic partnership. Maldives Visit the Smart City Education Chancellor and the transition to salt water. Bahrain Met Khalifa bin Salman Al Khalifa and MOU Memorandum of Understanding signed between the two countries aimed at developing relations in education. Health and travel around Thailand and Bahrain. Qatar Met Hamad bin Khalifa Al Thani. Kuwait Chaired the opening reception to strengthen the confidence of the Kuwaiti political and economic stability of the country. Germany Visit as a guest of the government and tight binding partners. The economic crisis, European added value of trade and investment in Thailand. France Exchange opinions on the economic crisis and the trend of French policy towards solving the problems and reinforce bilateral co-operation between them. United Kingdom The bilateral relationship between the Secretary of State; Meets Queen of the United Kingdom and the other Commonwealth realms. Sweden Met King Carl XVI Gustaf and Queen Silvia of Sweden. Belgium Visited Belgium in the 130 years anniversary of the establishment of diplomatic relations between them. Poland Student academic co-operation. Especially medical science, renewable energy, food processing and agricultural privatisation of Poland. Switzerland Meeting 42nd World Economic Forum And Attend a meeting of the UN Human Rights Council's 24th session. Italy Seeks Italy's partnership in strengthening South East Asian & South European co-operation. Vatican City Met Pope Francis in private audience. Turkey Both sides agreed to free trade agreements (FTA) Thailand–Turkey trade value to increase substantially within the next 5 years. Montenegro Open a new relationship and Special visit as a guest of the government. Mozambique Technologies into the private sector as Mozambique is a country with a high growth rate. Tanzania Knowledge about natural gas, mining, and wildlife conservation. Uganda Exchange of academic knowledge, both agriculture and fisheries. Nigeria How to manage nation major source of income oil and gas. Australia Visit as a guest of the government. New Zealand Visit as a guest of the government. Papua New Guinea Visit as a guest of the government. Brunei Visit as a guest of the government. Cambodia Visit as a guest of the government. Indonesia Visit as a guest of the government. Laos Visit as a guest of the government. Myanmar Visit as a guest of the government. Vietnam Visit as a guest of the government. Singapore Visit as a guest of the government. Philippines Visit as a guest of the government. Malaysia Visit as a guest of the government. ^ 'ปู'ปัดบินฮ่องกงพบพี่ชาย ไม่รู้'สมศักดิ์'อยากร่วมรบ. [""Pu" denied flying to Hong Kong to see her brother, not knowing "Somsak"'s joining coaliation"]. Thairath (in Thai). Bangkok. 8 July 2011. Archived from the original on 4 April 2012. ^ "Yingluck, Pheu Thai win in a landslide". Bangkok Post. 3 July 2011. ^ "Former Thai leaders Yingluck, Thaksin visit ancestral village in Meizhou, Guangdong". ^ "Yingluck to be 'clone' of ex-PM brother". The China Post. Taiwan. 4 July 2011. ^ Kate, Daniel Ten (16 May 2011). "Sister of Fugitive Ex-Premier Thaksin Chosen as Leader of Opposition Party". Bangkok. Bloomberg L.P.
^ Hookway, James (17 May 2011). "New Thai Candidacy". The Wall Street Journal. Bangkok. ^ Samuels, Lennox (9 December 2013). "Thailand Prime Minister Yingluck Shinawatra Dissolves Parliament, Calls for Elections". The Daily Beast. Retrieved 18 August 2015. ^ Jonathan Head. "BBC News - Thailand court ousts PM Yingluck Shinawatra". Bbc.co.uk. Retrieved 10 May 2014. ^ Kirton, David; Zheng, Lichun (7 January 2019). "Former Thai Leader Serving as Chairwoman of Chinese Port Operator". Caixin. Retrieved 8 January 2019. ^ The Statesman's Yearbook 2015: The Politics, Cultures and Economies of the World. Springer. 27 December 2016. p. 1202. ISBN 978-1-349-67278-3. ^ Srimalee, Somluck (2 February 2007). "SC Asset to invest Bt2 billion in 2007". The Nation. Thailand. ^ "Special Report: Thaksin´s 76 bn THB asset seizure case". Bangkok. NNT. 10 February 2010. ^ Taengkhio, Kesinee (21 December 2009). "Thaksin assets case verdict due in January". The Nation (Thailand). Bangkok. ^ "Thai premier banned from politics, ruling party dissolved: court". Bangkok. AFP. 1 December 2008. ^ ก๊ก"มิ่งขวัญ"ขวาง"ยิ่งลักษณ์"นั่งหัวหน้า พท. อ้าง"ผู้จัดการอำนาจ"ไม่ปลื้มนามสกุล"ชินวัตร" ["Mingkwan" faction obstructs "Yingluck" as PTP leader, claims "power manager" does not like surname "Shinawatra"]. Matichon Online (in Thai). Bangkok. 6 January 2011. ^ ดีเอสไอโชว์ผลงานตรวจท่อน้ำเลี้ยงเสื้อแดง [DSI shows red shirt funding]. Post Today (in Thai). Bangkok. Siam Intelligence. 17 June 2010. ^ Phoosuphanusorn, Srisamorn (28 January 2011). "Yingluck rules out taking Puea Thai helm". Bangkok Post. ^ "Yingluck: We'll reconcile". The Straits Times. 3 July 2011. ^ Ashayagachat, Achara (21 April 2011). "One year on, truth about crackdown remains elusive". Bangkok Post. ^ "Abhisit: It's us or chaos". The Straits Times. 3 July 2011. ^ Fernquest, Jon (27 May 2011). "Credit cards for farmers and more". Bangkok Post. ^ "Yingluck Shinawatra opposition leads Thai exit polls". BBC News. 3 July 2011. Retrieved 5 July 2011. ^ "Official balloting outcome". The Nation (Thailand). Bangkok. 5 July 2011. ^ Intathep, Lamphai (6 July 2011). "Suu Kyi welcomes outcome". Bangkok Post. AFP. ^ "Gen Prawit: Army accepts election". Bangkok Post. AFP. 4 July 2011. ^ "Assembly convoked to select PM this 5 August" (in Thai). Thairath. 3 August 2011. Retrieved 3 August 2011. ^ "296 favoured Yingluck's premiership, 197 abstained". Nation Channel. 5 August 2011. Retrieved 8 August 2011. ^ Ussavasodhi, Santibhap (8 August 2011). "Yingluck royally endorsed 28th PM of Thailand". Public Relations Department. National News Bureau of Thailand (NNT). 255408080021. Retrieved 9 August 2011. Pheu Thai party-listed MP Yingluck Shinawatra has been royally endorsed the 28th prime minister of Thailand. ^ See Proclamation on Appointment of Prime Minister (Yingluck Shinawatra) dated 5 August 2011. ^ "Chaloem to be Deputy PM" (in Thai). Thairath. 8 August 2011. Retrieved 8 August 2011. ^ a b Roberts, John (6 July 2013). "Thai cabinet reshuffle amid growing economic uncertainty". WSWS. Retrieved 7 July 2013. ^ Calamur, Krishnadev. "Thai Prime Minister Dissolves Parliament, Calls New Elections". NPR. Retrieved 9 December 2013. ^ "Court rules on PM's fate". Bangkok Post. Bangkok. 7 May 2014. ^ "Yingluck to be probed, ex-ministers charged on rice scheme". Post Publishing. Retrieved 16 January 2014. ^ "PM Admits Rice Panel Absences". Post Publishing. Retrieved 28 November 2013. ^ "Ousted Yingluck to face impeachment over rice-pledging scheme". The Nation. Bangkok. 8 May 2014. ^ "Yingluck indicted on rice-pledging scheme". Xinhua. China. 8 May 2014. ^ "Business lobbies, academics blast rice subsidies, govt's 'insincere' anti-graft sentiments". Thailand. 13 February 2014. ^ Shaohui, Tian (30 November 2014). "Former Thailand's PM Yingluck Impeachment Case to Kick Off in Early 2015". Women of China. Retrieved 30 November 2014. ^ "Ousted Thai PM Yingluck in court for corruption trial". Reuters. Bangkok. 15 January 2016. ^ McKirdy, Euan; Olarn, Kocha; Ly, Elaine (25 August 2017). "Arrest warrant issued for former Thai PM Yingluck Shinawatra". CNN. Retrieved 25 August 2017. ^ a b "Yingluck trial: Ex-PM 'flees Thailand' ahead of verdict". BBC. 25 August 2017. Retrieved 25 August 2017. ^ "Yingluck Shinawatra: former Thai PM fled to Dubai say senior party members". The Guardian. Retrieved 26 August 2017. ^ McKirdy, Euan; Paranasamriddhi, Angie (27 September 2017). "Former Thai PM Yingluck sentenced to five years over rice scheme". CNN. Retrieved 27 September 2017. ^ "Yingluck trial: Thai ex-PM sentenced to five years in jail". BBC. 27 September 2017. Retrieved 27 September 2017. ^ Yingluck Shinawatra has received the rank of "Volunteer Defense Corps General". 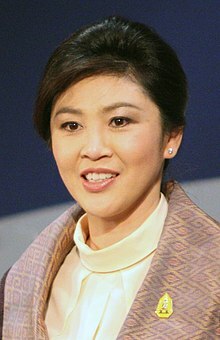 Wikimedia Commons has media related to Yingluck Shinawatra.